A Catholic Church where divorced and remarried Catholics are welcomed with open arms to receive the Eucharist. A Catholic Church where a priest, who may himself be married, can empathize with parishioners who bear family responsibilities. Is this concept of Catholic practice ahead of its time? Possibly not. It echoes the sentiments of one Roman Catholic Bishop from Brazil, Carlos Duarte Costa. For the most part unknown to contemporary Catholics, he was considered in his time to be a rebel by some, a saint by others. An advocate for the poor, he criticized the political leanings of the Roman Catholic Church in Brazil. The Church, in Duarte’s view, enjoyed a position of favor with the wealthy government; a government under which the privileged thrived while the poor were starving in the streets. Duarte Costa was also critical of the Catholic Church regarding the Vatican’s policy of silence during World War II. 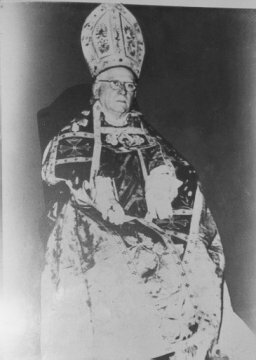 In Time Magazine (July 23,1945), Duarte Costa accused Brazil’s papal nuncio of “Nazi-Fascist spying” and also accused Rome of “aiding and abetting Hitler.” In a related New York Times article on July 7, 1945, Duarte Costa championed the abolition of celibacy and called for “a national Christian church,” independent of Rome in which priests would “have wives… and in which divorce would be tolerated.” Today, his church, a national church in Brazil, has a membership that numbers in the tens of thousands. On July 7, 1995, in Rio de Janeiro, his successors celebrated the Golden Jubilee of the founding of the Brazilian Catholic Apostolic Church. Ahead of its time? Not for over fifty years, it hasn’t been. Not in Brazil, nor has it been ahead of its time in Argentina or in Mexico. Is this a concept of church whose time should now come in the United States? It has certainly been considered by many contemporary Catholics as a concept long overdue. Multitudes of mainstream Catholics, because of divorce and remarriage or the practice of artificial birth control, feel unwelcome in the Roman Catholic Church. Bishop Brian Delvaux, pastor of Good Shepherd Church, in looking out at these numbers of scattered Catholics, is often reminded of the scene from Mark 6:34-35 and is moved to action. Christ, in looking out from the boat at the vast crowd upon the shore was moved with compassion, “for they were like sheep without a shepherd,” welcomed a broken humanity with limitless love and forgiveness. Good Shepherd Church, ecumenical in spirit, welcomes all baptized Christians, regardless of denomination, not only to be present for the celebration of the Mass but also to receive the Sacrament of the Holy Eucharist. Good Shepherd Church practices an authentic Catholicism rooted in the beliefs and worship of the Roman Church. The priests of this American Catholic diocese have been ordained by bishops who can trace their origins back to the Roman Catholic Church and to the Apostles. The apostolic heritage of E. Paul Raible, the Bishop who heads this American Catholic Community, comes down from Duarte Costa’s Brazilian Church. As excitement was abounding among Catholics throughout the United States who awaited the arrival of Pope John Paul II to New York and Philadelphia in October of 1995, and an annual US Bishops’ Conference in Washington, DC that November, local American Catholics were anxiously awaiting a groundbreaking event in the history of their own church. They were preparing for the arrival of representatives from Duarte Costa’s church. On October 1, 1995, Most Reverend Olinto Ferreira Pinto Filho (Primate Bishop) and Most Reverend Josivaldo Pereira de Oliveira (Vice President of the Brazilian Council of Bishops) flew from Rio de Janeiro to Southern California. They assisted the Most Reverend E. Paul Raible in the ordination of Fr. Brian P. Delvaux as Auxiliary Bishop of this Independent Catholic Diocese. Delvaux, a native of Southern California, was an altar server in elementary school and completed twenty years of Catholic education. He was ordained a priest in 1974 by Cardinal Timothy Manning after his seminary training at St. John’s Seminary, Camarillo, California. During his six years as a Roman Catholic priest, he served as associate pastor at St. John Fisher Church in Palos Verdes and at St. Patrick Church in North Hollywood, where he later became administrator of the parish. In 1980, after leaving the priesthood in order to be free to marry, Delvaux studied counseling as a graduate student at California State University in Long Beach. He later returned to the ministry as associate pastor of St. Matthew American Catholic Church in Orange, California, and then on to Good Shepherd Church as founding pastor. “I believe married priests may, in fact, be more effective pastors,” Delvaux says, “because marriage can equip them with a powerful empathy. This empathy, in my view, accomplishes far more than the objectivity valued so much by proponents of an exclusively celibate ministry”. To this day, he continues to do what he always knew a priest should do. He visits the sick, serves the needy, counsels the troubled, and shepherds the flock. 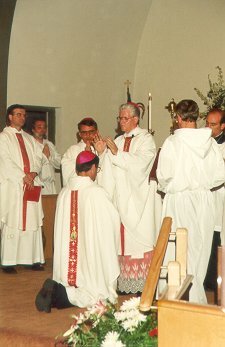 The Ordination of Bishop Delvaux on Sunday, October 1, 1995, in Long Beach, California represented a commitment to the future — a future which envisions an increasing number of parishes dedicated to transforming an “idea ahead of its time” into a reality whose time has finally arrived.